The Sludgelord: ALBUM REVIEW: Russian Circles - "Guidance"
I owe Russian Circles a big apology. Many years ago I saw them play a couple of times on bills with High On Fire and Earthless. At the time I dismissed them as boring, generic post rock unworthy of sharing the stage with such mighty riff warriors. One listen to the Chicago trio’s new LP “Guidance” was enough to make me realise I’d made a terrible mistake. The sleepy drum less haze of “Asa” provides a gentle start to the LP. The calm is soon destroyed when “Vorel” lumbers into view. A leviathan of rumbling drums, gritty bass and insistent, buzzing guitar lines, the track sets the tone for things to come. Along with “Mota” and “Afrika” it demonstrates an irresistible blend of intricate post rock with subtle hints of black metal. The effect is similar to what Latitudes achieved on their awesome “Old Sunlight” album earlier this year but stamped with Russian Circle’s distinctive identity. “Calla” provides the album’s heaviest cut and brings some no-nonsense heavy riffs to the table. This track best demonstrates the band’s serious low-end crunch bought by Brian Cook. His four-string Midas touch is in full effect here, bringing a crushing density redolent of his work in Botch and Sumac. “Overboard” and “Lisboa” are the closest the band come to traditional post-rock but both tracks demonstrate how to avoid the pitfalls of the genre with style. The former is an affecting, dreamy soundscape, all the more effective for its restraint and lack of distortion. The latter features quiet/loud dynamics and soaring delayed guitars but both elements are employed in such a way to make them sound vital instead of stale and predictable. 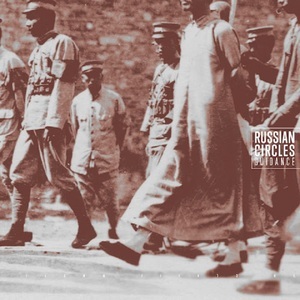 “Guidance” is a stellar release from Russian Circles. The band breathe new life into an often dull and played-out genre with dazzling results. Being proved wrong has never sounded so good.